Google Voice, which lets users consolidate all their phones under one number, archive your texts and voicemails, and much, much more, is two things to most people: vaguely promising, and totally confusing. Here's how to make the switch, in plain English. 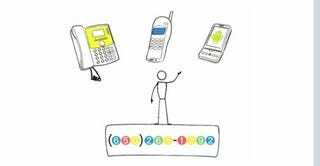 It doesn't really help to describe Google Voice in terms of what it is—a bizarrely fragmented hodgepodge of different telecom and internet technologies, drawn together by Google—so you just have to start with what it does. In short, it can completely change how you use your phones, more or less for free. • It can give all of your phones the same number for incoming calls. Google will assigned you a new, Google Voice-specific phone number for free, which you can forward to as many phones as you want. What always drives the point of Google Voice home for people is when I have them call my number, which causes three of my phones to ring at once. You can keep this number forever, too, without ever having to worry about porting it from carrier to carrier. • It can give your phones the same outgoing number as well, with which you can make free domestic calls (well, sort of—more on that later), and very cheap international calls. Since Google Voice routes your calls through their phone system, they can connect you directly to cheap VoIP services to the rest of the world. It seems like you're just making a regular call, but behind the scenes you're doing something more akin to Skyping. End result: money saved. • You can send and receive unlimited text messages for free. To make things even better, they're all all archived in your online Google Voice account, where they're fully searchable. • It's got the best voicemail system in the world. Leaving a message at a Google Voice number is nothing like leaving your voice on a regular voicemail service—that is to say, it's not like sending your voice into a barely accessible technological horror pit where it might get listened to, but will probably be ignored. No, Google Voice is different: It stores your messages online, and converts them to text (which can then be sent to you as an SMS or an email). You can archive, forward, delete or save these messages from a simple interface on your phone or computer. Think of it as Gmail, except with voices. Plus, it's flexible in lots of little ways—you can change your voicemail greetings on a per caller basis, for example, or opt to listen to voicemails as they're being recorded. • This voicemail system isn't just for Google Voice numbers, either—you essentially replace your carrier voicemail with Google Voice voicemail, without using a new number. It's brilliant. • You have full control over your calls. You can record them for later listening, and have them transcribed into text. Each of these features is compelling enough on its own—together, they'll totally change how you use your phones, changing you from a mere mobile customer to a full-on switchboard operator, self-spy, info hoarder and telco executive. It's like you run your own little phone company, just for yourself. For free. Spectacular. • You can't use your own phone number. At least, not in the way you wish you could. In an ideal world, you'd be able to port your old cellphone number to Google Voice, and have that—the digits people have been using to get in touch with you for years—be your new all-inclusive point of contact. You can't do this yet. For now, the closest you can come is to port your voicemail to Google Voice. That means that your T-Mobile, AT&T, Verizon or Sprint number's voicemail can be outsourced to Google, but not its calls. You can unify all your phones under your new Google Voice number, but that means you have to switch. Along with the basic inconvenience of telling everyone about your new number, you're trusting an awful lot in a beta service, the terms of which could change quickly and without notice. It's not something I worry about, but it's not nothing, either. • You can't record calls that you've placed, just calls that you've received. And every time you initiate recording, Google Voice notifies the other person on the line. This is all makes perfect moral and procedural sense, but just in case you had the impression that there were no limits on your recording abilities, well, there are. • The mobile app situation isn't ideal. There are apps for Android, BlackBerry, Windows Mobile and iPhone via jailbreak, and they all work. That said, they're not perfect—they can be slow, poorly integrated, glitchy, or hard to figure out. And since they're supposed to replace the dialer on your phone entirely, this isn't wonderful. The online mobile interface is a good fallback for placing calls and sending texts, but navigating to that adds an extra step to any call or text that can get tiresome after a while. • Lastly, the way American phones work, you're still going to end up paying for your minutes, somehow. Just because Google Voice says you can make free domestic calls and cheap international calls doesn't mean that you actually can: in both cases, you need to dial out to Google Voice's external system in the first place, which means you're still using your monthly minute allotment. There are ways around this which I'll discuss later, but Google Voice, as good as it is, isn't magic. Discouraged? Don't be. Google Voice is still well worth you time and effort, and it's only going to get better. Now, for God's sake let's get started already. Signing up. This is simultaneously the easiest and most irritating part of Google Voice: It's still invite only. Lucky for you, "Invite" in this case doesn't mean you actually have to wait for an individual to select you from the masses; it's just Google's way of saying their keeping the signup pace down at manageable levels while the service is still in beta. Just submit your address, after which Google "anticipate[s] that it will be a short wait before you receive your invitation." What's a short wait? My invite took about four days. Some come within 48 hours. At worst, they take about two weeks. Lots of you will have already received your invite, and just not done a whole lot with it—you guys can keep reading—while the rest of you should just bookmark this post, and come back to it once you get your invite. Protip: check your spam filters. Logging in. Follow your confirmation link, or navigate here. Click around for a while to get a feel for the interface. This is how you'll manage your phones from now on. It's liberatingly simple. Picking your number. You'll be given a choice of numbers, which you can choose from practically any available area code. Choose wisely: this will be your primary number from here on out. Choosing your first number is free; changing it in the future will cost you $10. Boo, waah, etcetera! But really not a huge deal. Adding your phones. This is assuming you want to forward a single number to all your phones, which is kind of the point here, so: Go to the Google Voice settings page (up in the upper right-hand corner of the screen. In the first section, called "Phones," click "Add a Phone" or "Add Another Phone." Give it a name "My iPhone" and enter its phone number. That's it. Now you'll be given a passcode, which you'll use to authenticate your existing phone. Clicking "Connect" will call your phone from your Google Voice number, and a friendly robot will ask for you code. Enter it. That's it! Setting up your voicemail. Now that the phone is added, it can accept calls directed to your Google Voice number. If the call is ignored, it will forward the voicemail to Google Voice, where it will be stored online. Alternately, if you only want to use Google Voice for voicemail, you can disable the calling feature (by unchecking the box next to the phone), and set up the service to hijack your actual cellphone number's voicemails—even when the call didn't get routed through Google Voice. This is much easier that it sounds: Just click "Activate Google Voicemail" next to your newly-added phone, and enter the number they give you exactly as it's written, symbols and all. Once you "call" that number, you'll get some kind of message on your phone. On the iPhone, it looks like this. Choosing the rest of your settings. Now you'll see your phone listed under the "Phones" settings tab. The other tabs contain a few pages of settings for your Google Voice account. How you toggle these is up to you, but here are the most important ones: If you want to forward SMSes to email, you'll have to enable that in the "Voicemail and SMS" tab; call screening settings are located under the "Calls" tab; and international call credit can be added under the "Billing" tab, from a credit card. Finding your feet. Take some time to experiment with some of Google Voice's core features now. Place a call using the button at the top left of the Google Voice homepage. Enter your recipient's number, and choose which of your phones you'd like to place the call with. Google Voice will call your phone first, which upon answering will immediately call your recipient's phone, which will think it's getting a call from your new Google Voice number. It might sound odd in writing, but once you see it work, it just kind of clicks. You can also place these calls from the mobile web interface, without a computer. Texting is more direct—you can send those directly from the web interface without any intervention from your phone. • Apps: This is by far the best way to use Google Voice. Android has an official Google Voice app, as does BlackBerry.These automate the dialing/texting out process, so you don't need to mess with a web interface—you just opt to make some or all of your calls through Google Voice, and the app takes care of the rest. Windows Mobile has unofficial clients that do the job pretty well, as does the Pre, in the App Catalog. iPhone clients are available, but they're not approved by Apple: You'll need to jailbreak your phone and install them from Cydia. • The contact method: This is a little cheat to automate the aforementioned process. What you're doing, basically, is saving your Google Voice number, a pause, the number 2 (which selects "call another phone" from the Google Voice automated menu tree), a pause, then your recipient's number. Adding a pause is different on each phone—on the iPhone, for example, you need to save a number as a contact, and in the number editing screen, press the "+*#" button at the bottom left of the keypad. The zero will be replaced with a "pause" button, which when pressed inserts a comma into the number. Google is your friend for this one, though most smartphones make the option available in their respective contact editing screens. • The 406 method: Have the person you want to text send a message to your Google Voice account. When you receive the message, it will be from a number you don't recognize, with the area code 406. It will be labeled with the sending contact's name, and any replies to that number will return to the person who sent them, but the number is completely new. This is a Google Voice alias, which you can use forever: Just save it as part of your friend's contacts—perhaps as a secondary cellphone or a work number, whatever you can remember—and use it as their primary contact number when call through GV. Sending Texts. Again, using the web interface is a great way to send texts, as are the mobile apps. But the best solution? The 406 trick listed above works for SMSes too. As you've probably noticed, Google Voice is kind of a loose system—and a system that's ripe for a little gaming. There are two methods that currently work for getting truly unlimited, free calls over Google Voice. This is where things get really interesting. Interesting in a good way for you; interesting in a terrifying way for the phone companies. To make incoming calls—including outgoing calls initiated from the Google Voice web interface—free, you'll need to change your Google Voice settings under the "Calls" tab. Select "Display my Google Voice Number" under the "Caller ID (in)" setting, and you're good to go. A full setup guide for the calling circle method can be found here. Note: Designating Google Voice as one of your preferred contacts may be against your carrier's user policies—check with them if you're concerned. • The VoIP method: By signing up for a number with free VoIP service Gizmo5 and adding to to your Google Voice account as a phone, you can place unlimited free calls from your VoIP number to landlines. You can also forward the calls through to Skype, if you'd prefer. This isn't a solution for mobile phones, but it's a great way to make yourself an effectively unlimited VoIP landline for free. Lifehacker's got the whole rundown here. UPDATE: Registrations for Gizmo5 have been closed. Sorry! Lifehacker has assembled a fantastic guide for easing the transition from many numbers to one, covering everything from how to convince people not to call your old numbers, to coping with voice latency. That's pretty much it! If you have any tips to tricks for getting the most out fo Google Voice, please drop some links in the comments-your feedback is hugely important to our Saturday How To guides. And if you have any topics you'd like to see covered here, please let me know. Happy Voicing, folks!